A little something fancy for that special thank you gift! 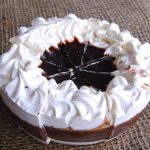 Our Wedges of Soap Cake contain Organic Coconut and other oils and are meant to be used…. but don’t have to be if you want to show them off! A delicious fragrant combination of Coconut and Chocolates, cut into 8 mini wedges, just a great nourishing fun soap with lots of bubbles, an of courese our Organic Coconut Oil for the ultimate luxury. A great fun gift. 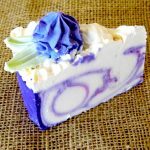 Lots of Rich frothy luxurious bubbles in this delicious Large slice of Soap Cake. Gorgeous fragrances of layers of Chocolate, Coconut, Vanillas and Caramel., topped with delicious Raspberry cherries. 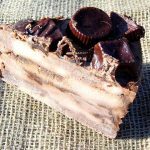 Great for a gift for Dads or Chocoholics! Swirls of beautiful Pure Lavender essential oil in purples and whites together with Organic Coconut oil, Coconut Butter, Virgin Olive Oil and pure Ricebran oil. Icing on top, with handmade soap flowers to complete the perfect Slice of Soap Cake. Comes boxed, perfect for a gift. Layers of beautiful pink rose fragrant soap, formulated with Organic Coconut oil, Coconut Butter, Virgin Olive Oil and pure Ricebran oil. Gorgeous shades of pink and white layers and Icing on top. 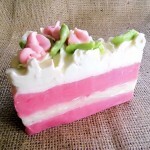 A hand made soap flower and leaves completes the perfect Slice of Soap Cake. A box is included, perfect for gift giving.